My name is Gerald Koch and I have been subpoenaed to a federal grand jury based in the Southern District of New York regarding the 2008 Times Square Military Recruitment Center bombing. This is my second subpoena concerning this matter; I was also subpoenaed in June of 2009. I refused to testify at that time based on the assertion of my First, Fourth, Fifth, and Sixth Amendment rights, as I will be doing again for the duration of this grand jury. During the first grand jury, the government informed my lawyers that it was believed that I was at a bar in 2008 or 2009 where a patron indicated knowledge of who had committed the bombing. When I was first subpoenaed to the grand jury in 2009 I had no recollection of any such incident— a fact that I expressed publically. Now, almost 4 years later, I still do not recall the alleged situation. UPDATE: 5:25 p.m. — Lawyers for environmental activist Daniel McGowan said in a statement Friday afternoon that he had been returned to his halfway house in Brooklyn. They added that they had confirmed McGowan was jailed by federal marshals on Thursday for his Huffington Post blog post — on the basis of a prison regulation that was declared unconstitutional by a judge in 2007. Daniel McGowan has been released from the Metropolitan Detention Center in Brooklyn where he was taken into custody yesterday and is back at the halfway house where he has been residing since his release from prison in December. Yesterday, Daniel was given an “incident report” indicating that his Huffington Post blog post, “Court Documents Prove I Was Sent to Communication Management Units (CMU) for My Political Speech,” violated a BOP regulation prohibiting inmates from “publishing under a byline.” The BOP regulation in question was declared unconstitutional by a federal court in 2007, and eliminated by the BOP in 2010. After we brought this to the BOP’s attention, the incident report was expunged. The Bureau of Prisons did not immediately return a request for comment. NEW YORK — The jailing of environmental activist Daniel McGowan is under review, a Federal Bureau of Prisons (BOP) official said Friday morning. McGowan, who pleaded guilty to arson linked to the Earth Liberation Front in 2006, was serving out the final months of his seven-year sentence in a Brooklyn halfway house when he was jailed by federal marshals Thursday morning, allegedly for writing a commentary on The Huffington Post critical of a harshly restricted federal prison unit in which he had spent time. Rivers declined to say more about why McGowan was moved to the Metropolitan Detention Center, citing privacy issues. But she noted that a determination would be made in McGowan’s case by the end of Friday. In general, Rivers said, prisoners can be punished for violating a BOP rule that prohibits giving interviews to the news media without official approval. But that rule says nothing about prisoners writing blog posts. McGowan’s wife, Jenny Synan, told HuffPost that neither he, his lawyers nor a BOP official she talked to about the case had heard of a regulation prohibiting prisoners from writing blog posts. Just when we thought it was over…. We have some bad news to report. This morning Daniel was taken into custody by federal marshals and is now at the federal detention center in Brooklyn getting processed. We are still waiting to hear why this has occurred. Considering his exemplary behavior at the halfway house, approved weekend passes and the full-time job he started as soon as he was released back to the city this is all pretty insane. The Bureau of Prisons has proven to be cruel and vindictive time and time again. Anyway, what YOU can do right now is write to Daniel and send your love! We don’t know how long he will be here, but there is a good chance it will be until his sentence officially ends on June 5. Thanks for your continued support! We will keep you updated as we learn more! 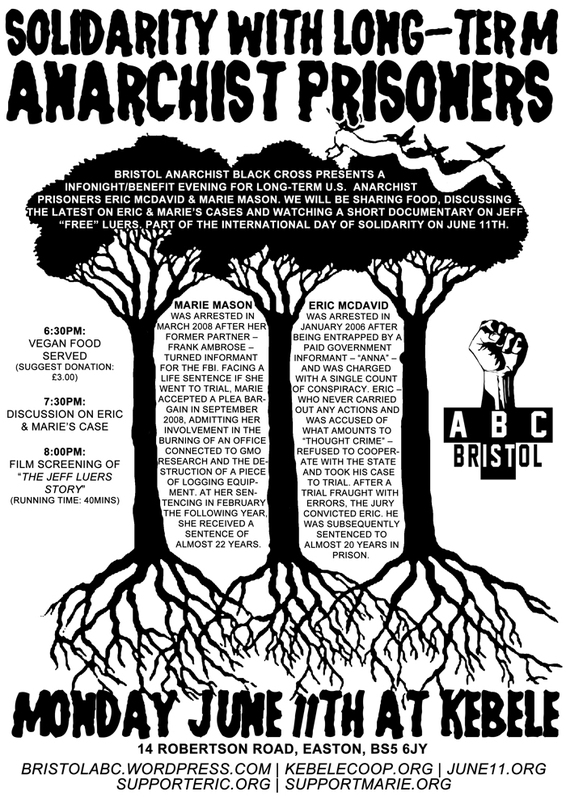 Bristol ABC presents an infonight/benefit evening for long-term U.S. anarchist prisoners Eric McDavid & Marie Mason. We will be sharing food, discussing the latest on Eric & Marie’s case and watching a short documentary on Jeff “Free” Luers. 8:00pm: Film screening of ‘The Jeff Luers Story‘ (40 mins). Marie Mason is a long-time environmental and social justice activist and loving mother of two. In March 2008, she was arrested on charges related to Earth Liberation Front actions that occurred in Michigan in 1999 and 2000; no one was injured in the actions. On February 5, 2009, Marie received an outrageous 262 month sentence (a little under 22 years). The sentence was higher than even that asked for by federal prosecutors. Marie’s sentence is the longest given to any “Green Scare” defendant to date.